Since “Convoy 2000” — the two-week, 7,000-mile “vacation” that I took nine years ago — I’ve only made two long-distance driving trips. Changes in my life and the price of gasoline were the largest contributors to my lack of mobility. I’ve had a lot of free time, just not the kind of time that would allow me to truck across the country for two weeks at a time. So when I got an excuse to travel, I took it. No news is usually good news, right? I have agreed to narrate Aaron Copland’s “Lincoln Portrait” with the Great Western Rocky Mountain Brass Band in Silverton late in August. That is, if my pacer is still ticking. You may take this as news, if you like. I’ll let you know the exact date. Maybe I’ll see you then? That would be nice. I did a little research, found the dates of the Festival (Friday, August 14 through Sunday, August 16), made a reservation at a local motel (Triangle Motel, on Greene Street in Silverton), and bought a new set of maps on which to chart my route. I don’t have — or use — a satellite navigation system. I think that GPS is like a digital watch: it can tell you about now, but it doesn’t show you information about the past, and it doesn’t tell you enough information about the future; everything that a good map can do. Then followed two months of waiting. I made lists, checked them twice, and made certain that everyone who needed to know was aware that I would be unreachable for a week. When I’m “out-of-the-office”, I don’t answer the business telephone or my e-mail; if I did, I would probably find myself wasting time worrying about stuff that I couldn’t deal with until I got back home. I don’t even bring a notebook computer with me. Well, I had my iPod, but that was a necessity: it has all of my C.W. McCall music on it. Early on the morning of Wednesday, August 12 I made a final check of my e-mail, read my usual online comic strips, then packed my bags into the truck, hooked up the iPod, kissed my wife goodbye, and headed towards Rockford, Illinois and Interstate 39. My plan was to be west of Omaha by nightfall on Wednesday, somewhere near Denver on Thursday, and in Ouray, Colorado by Friday noon. Despite a few bouts of road construction (I wasn’t always traveling on an Interstate highway; occasionally, I needed some real scenery). I made my ETA with fifteen minutes to spare, arriving in Ouray, Colorado at 11:45 a.m. Mountain Time. I called up Bill and said “Hi! I’m in town!” and he said “Come on up!” and I drove up the side of the mountain to Bill’s house and parked at the bottom of his inclined railway. I spent the next five hours with Bill and Rena (a.k.a. the “R.J.” of “Black Bear Road”), their two dogs, and Bill Jr. who had driven in from Denver for the show. He was going to be video-recording his dad’s part of the show, because any live appearance by Bill Fries is a rarity these days. About 4 o’clock the weather changed a bit. What had been cool and mostly cloudy had now turned to rain, but not heavy. That’s when I remembered that I’d left my windows down, so I made a quick dash (well, as quick as possible, given the fact that I was twenty feet above the driveway and had to take a ride down on the inclined railway) down to my truck to roll up the windows. I grabbed my hat from the truck and went back upstairs through the continuing drizzle. Rena baked a frozen pizza (Red Baron, pepperoni, for the detail-oriented) for a snack. A little after 5 o’clock we got ready to go. I moved my truck so that Bill Jr. could get his car out of the way of Bill Sr.’s Jeep, and I left for Silverton while the Fries Family followed somewhere behind. Bill had been asked to arrive at the Festival one hour before showtime, and the 24-mile trip between Ouray and Silverton typically takes about forty minutes. Those of you who driven this section of US 550, the “Million Dollar Highway”, will know what I’m talking about. The rest of you, use Google Earth and you’ll see why driving this road takes a while. Don’t bother using a Rand McNally map for elucidation: on paper, this road seems almost straight. It ain’t. The rain that I’d seen in Ouray was still present all the way to Silverton; at times there was a downpour, which is pretty interesting when you’re moving at 25 miles per hour around a mountain curve and you can’t see the oncoming traffic until it’s almost on top of you. I passed one point of concern: just north of Red Mountain Pass, the road was down to the one northbound lane as a wrecker was being used to pull some unfortunate delivery truck off the side of the road on the southbound side. Given that “off the road” on this highway can usually mean “at the bottom of the mountain”, this truck driver was indeed lucky. I got down to Silverton at about 6 p.m. and checked into Triangle Motel. I sorely needed a shower and a shave, as I hadn’t either since Wednesday morning. (The way that I travel when I’m on my own usually doesn’t involve staying overnight in modern accomodations.) Then, once again clean and presentable, I drove over to the Kendall Mountain Recreation Area, which was about a mile-and-a-half from the motel, and parked near the big white tent under which the festivities where to be held. I would have walked to the Recreation Area from the motel, but the rain was still falling and I didn’t fancy getting to the show and looking like I’d drowned on the way over. Bill, Rena, and Bill Jr. were seated in the front row at the right end. Bill Jr. had set up his video camera, pointing it towards the edge of stage left where a lecturn stood, behind which was a sturdy chair for the guest performer. That chair was not one of those folding metal contraptions, which is what the rest of the audience was sitting upon. But Bill wasn’t doing much sitting, as he was greeting people and signing autographs for a small crowd. Even though many of the attendees at this performance wouldn’t have recognized Bill by sight, he was a familiar face to a lot of the locals and quite a few of the out-of-towners. This appearance ot the Brass Band Festival was not Bill’s first: he had been part of the production in 1989, and in a couple of the years since then. The band consists of fifty-odd brass instruments, plus percussion and xylophone. No strings, no woodwinds. This is especially interesting, as the compositions which the band plays have often been rearranged for a brass band, having been originally written for an orchestra. For example, the piccolo part in “The Stars and Stripes Forever” isn’t played by a piccolo (which is a woodwind), it’s played by a horn; and very well played, as I observed in the four performances given by the band this year, at 7 p.m. on Friday, 12 noon and 7 p.m. on Saturday, and 12 noon on Sunday. The theme of this year’s Festival was “Abraham Lincoln Bicentennial, 1809-2009”, commemorating the 200th anniversary of his birth. That was the reason for the inclusion of Bill Fries in this year’s program: once Paul Maybery, the conductor, had settled on the theme, he decided to include a composition by Aaron Copeland, “Lincoln Portrait”, which requires a narrator. Paul thought about who he could use as a narrator, and he realized that he needed a well-known, distinctive voice. Paul had worked with Bill Fries before, and Bill’s voice was strong and recognizable, thanks to his fame as "C.W. McCall". The invitation was sent, and Bill said yes. Also coincidentally, Aaron Copeland is Bill’s favorite composer: Copeland works were used for the soundtrack of the multimedia presentation San Juan Odyssey . When the band took the stage, they were dressed in appropriately “old-fashioned” costumes from the late 1800s, as you might seen worn by an actual brass band at the time. Paul Maybery wore a true band conductor’s uniform (which, curiously, looked at lot like a train conductor’s uniform). Each show opened with “The Star Spangled Banner”; the evening shows lasted about three hours, with an intermission at about an hour-and-a-half in, and the noon shows were about an hour-and-a-half in total. “Lincoln Portrait”, with Bill’s narration, closed out the first half of the two evening performances, and Bill returned on Sunday for a final go at noon. I would try to describe his performance, but it was something that really can’t be described, only experienced. 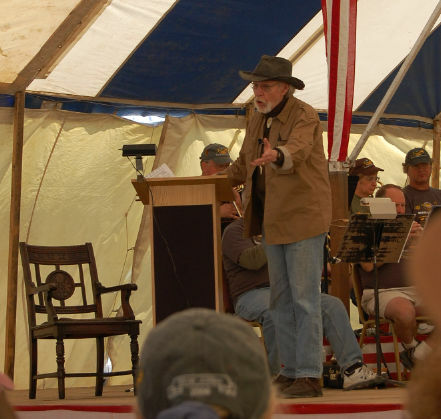 If you listen to Bill’s narration on San Juan Odyssey , you can get a good idea of what “Lincoln Portrait” sounded like, here at the festival. The playlist for the band varied by performance, but every show included a good selection of marches and other pieces. Mona Kreitner, a soprano, continued her chain of appearances at the Festival with a wonderful “Ah! Je veux vivre” from Gounod’s Romeo and Juliette ; and if you were lucky to see an evening performance, there was also Irving Berlin’s “Always” and a guy in a rabbit costume. The major work that was presented, the “Grand Tableaux” as the program called it, was Moussorgsky’s “Pictures at an Exhibition”. This was an especially intriguing piece, as it is another work that was rearranged for brass band (it was written for piano), and it lasts for 29 minutes (or longer, depending upon how tired the band gets). As conductor Paul Maybery said, “there are no ADD (Attention Deficit Disorder) musicians in this band”. The encores also varied by performance, but I can safely say that the most entertaining of those encores would be xylophonist Dennis Kurtz’ tap-dance routine during “Give My Regards to Broadway”. Great Western Rocky Mountain Brass Festival, Inc.
for information on the Festival and the recordings. I’ve ordered two copies of this year’s Festival, at $20.00 each. Remember the weather? During Friday night’s performance the rain fell steadily until about the intermission, which occurred about 8:30. Then the temperature dropped, until at the end of the show, a little after 10, the local lack of heat was about 40° Fahrenheit. This made me glad that I had driven to the Kendall Mountain Recreation Area, because walking back to my motel that night would have been annoying. Not that I wasn’t prepared for the weather: I was wearing a lined jacket and had a sweater in my bag, because the expected low temperature was about 35° Fahrenheit. Silverton City Hall; To the seedy side of town; Snow conditions in August. Saturday’s noon show was breezy: the sides of the tent were constantly being whipped open, and a couple of times a support guy had to be tightened when a side support was knocked out of line by the flapping canvas. The Saturday night show had better weather, with no breeze and the temperature dropping to only the mid-50s by the conclusion at about 10:30 pm. And Sunday at noon was bright, sunny, and casual: the band got to wear blue denim jeans and official “Brass Band Festival” t-shirts and sweatshirts instead of the usual uniforms. And I got to meet a Crispy Critter! At the Friday night show, I met Ruth Kauffman from Pennsylvania, who had traveled with her grandson to see the show. Ruth brought along a picture of herself and Bill Fries, taken ’way back in the early ’90s. I later received a message from Ruth about her visit, and to me it reads a lot like “Black Bear Road” or “Classified”. If only it could be put to music. I did not have a chance to ride the Durango-Silverton railroad — it takes a day-long investment, and I just didn’t have the time — but I did get some pictures while the train was in Silverton for turnaround. Coincidentally, the Durango-Silverton Railfest was also occurring this weekend, and one of the highlights is the appearance of Number 5, The Galloping Goose! The Goose is usually located in Dolores, Colorado. This is one of the few times that she comes out of retirement, to once again haul a few passengers between Silverton and Durango. Monday morning came around too soon, and I had to leave Silverton. But since I’d come this far west, I wanted to drive a road that I never had: Interstate 70 through Glenwood Canyon, over Vail Pass, and through the Eisenhower Memorial Tunnel. So northward I went, back up through Ouray and Montrose, and turned right at Clifton. Glenwood Canyon. Yeah, I know that this is a really beautiful area; I’ve seen photographs of the time before the highway was widened, when I-70 was just a two-lane road. And I can understand why this road needed to be improved and widened, and why those improvements were protested: just listen to C.W. McCall’s “Glenwood Canyon”. But this is one of the best-looking roads that I’ve ever seen: the concrete has a brown shade to it, not the usual white/gray color that you usually see; the steel guard rails are correspondingly grayish, and not shiny. The separated eastbound and westbound roadways, terraced on the mountainside, leave plenty of road for vegetation of all sorts. While you’re on this road, you might just think that you’re still on an old two-lane winding along the bottom of the canyon, next to the river. However, despite the posted 50 mile-per-hour speed limit, I did encounter many idiots zooming through the Canyon and missing the scenery. I would describe those drivers in stronger terms, but my lawyer tells me that “moron” has a specific legal definition. Nevertheless, drive through here if you get a chance. If only the other rural highways in America looked this good. Eisenhower Memorial Tunnel. “One of the world’s highest vehicular tunnels.” Hey, people, turn on your lights! Just because the tunnel’s illuminated doesn’t mean that I can see you! Vail Pass. I drive a Saturn VUE, 2003 vintage, with a CVT (continuously variable transmission) and a four-cylinder engine. I have never before heard so much whining from this truck before, as it constantly attempted to shift to get me up the inclines along this road. And during many of the downhill runs, I was locked in "intermediate" gear trying to slow down. I have a great respect for all of those truckers out there, ’cause staying at 65 mph downhill isn’t always easy! Next time, I’m taking the “old route” along US 6 and over Loveland Pass. While on my eastbound trip over the Rockies, I listened to Crossing the Rockies with C.W. McCall, a production of the Colorado Motor Carriers Association. You can listen to the audio of this record on the CMCA website. An audio CD is also available. And that’s all of the interesting events. I stopped for the night near North Platte, Nebraska, and made it home to McHenry, Illinois around 6 p.m. Tuesday. I wonder what I’ll do next year?